In the first stages of creating a new company, timing can be everything. The folks behind SURF Incubator know that principle all too well. As they were trying to build a new group office for technology startups, a few of the key pieces started falling into place. An entire floor of office space in downtown Seattle was available, already wired because of previous tenant Varolii. Startups were interested in claiming a spot, hoping to work next to other entrepreneurs for $300 each per month. Things are certainly looking up now. Less than two months after officially opening its doors with 15 startups as tenants, SURF has doubled the number of companies renting out desks on the eighth floor of the historic Exchange Building in downtown Seattle. There could be more on the way. Bergquist, who left a job in commercial real estate with Washington Partners to help form SURF, says there are more than 100 potential tenants in the pipeline who might want to join the collaborative startup office. The company, which does not take equity in tenant startups, also has signed up several sponsors, including Microsoft BizSpark and Wowrack, which offers free Web hosting. SURF (it stands for Start Up Really Fast) was founded by Seaton Gras, who had been organizing meetups and mentorship networking for technology entrepreneurs for a couple of years. His idea eventually evolved into a real-estate-based incubator, offering services and office support to startups for a relatively cheap monthly fee of $300 per person, with no long-term commitments. It’s not the only game in town. Places like StartPad and TechDwellers also offer shared office space to entrepreneurs, which allows a small team to have a decent office and puts them next to people they can collaborate with and learn from. This is different from what are more commonly thought of as “accelerators,” which typically means a competitive application process and an equity stake for the firm running the show, in exchange for a boot-camp-like development course, demo day, and expert mentorship. 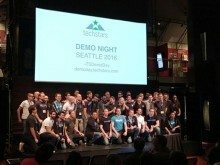 TechStars is a top-shelf example of that model. The prominence of incubator spaces tend to ebb and flow with the trends in a city the size of Seattle, and SURF is betting that the time is right for another upswing. The big-picture pieces are certainly there—a lot of vacant office space following the Great Recession, dramatically reduced costs for getting a technology startup running, and the rise of “lean” business principles that emphasize bootstrapping, building products quickly, and shifting gears immediately when a project fails. Digital developers in particular also have a bent toward collaboration and open-source projects, Bergquist notes. That’s why SURF is emphasizing the community aspect of its service—the application process tries to keep a good balance between the types of skills that the entrepreneurs bring with them. Today, SURF has game developers, an e-commerce site, a mobile payments startup, and even a personalized medicine software company. Even with all that feel-good mojo, SURF isn’t a nonprofit. It’s more like a for-profit that isn’t making money at this point. So how do they eat? “I’m still trying to figure that out,” Bergquist jokes. But the project has gotten enough early sponsorships and rent money to pay salaries for Bergquist and Gras, and add two more full-time employees and an intern to keep things humming. Service providers and other possible sponsors, he says, are starting to see the value of the collected entrepreneurs and are keen on offering discounts and free goodies to build a relationship. In that way, it’s not unlike the Cambridge Innovation Center right near MIT, a large entrepreneur-focused real estate service company that has several floors of interesting workspaces for rent. Bergquist also points to Rocketspace in San Francisco as a close parallel to what SURF is looking to accomplish. Congratulations to Neal and Seaton for launching SURF! We strongly believe that entrepreneurs are more likely to succeed when they work in community with other entrepreneurs — and the world needs more successful entrepreneurs! Places like SURF can help make it happen.